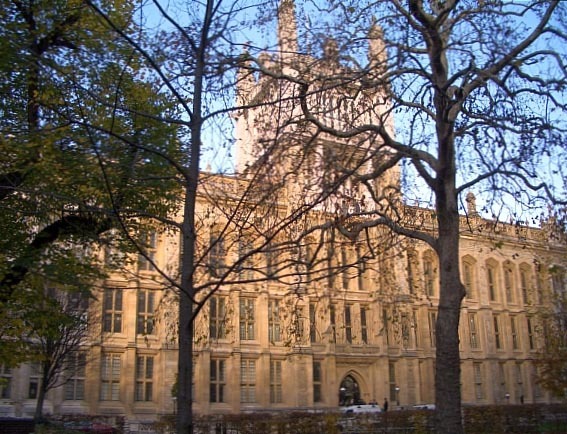 The Maughan Library, King's College London (formerly the Public Record Office). This fine Victorian building in Chancery Lane was acquired by King's College London in 1998, after the opening of a new Public Record Office in Kew. It is now sometimes mistaken for the main college building. In fact its history goes back much further, to medieval times: the first building to occupy the site was a sanctuary for converted Jews. After Edward I expelled Jewish people from England in 1290, the Master of the Converts here took on the office of Master of the Rolls (that is, the records of the Court of Chancery), and eventually, in the early eighteenth century, the medieval chapel on the site was incorporated into a new Rolls House. In 1837, this became Crown property. Ten years later, James Pennethorne, who had inherited John Nash's practice, published a proposal for a new building to house the burgeoning national records. Work started in 1851. Chancery Lane is in the heart of legal London, and Pennethorne faced the usual constraints of a central London architect: an awkward site and inadequate funding. And there were some unusual demands, too. To minimise the fire risk, each storeroom had to be self-contained, and lit only from outside. These requirements account for the box-like rooms with their intimidating iron doors, and, more cheerfully, for the large number of windows. Cast-iron was used to special effect in the stairwells and the Round Room. The latter was added in 1863, and is considered to be "the finest example of this type of building in London" ("Chancery Lane Library...," 5-7). Although it owes an obvious debt to Sydney Smirke's larger Round Reading Room at the British Museum, opened in 1857, the dome is quite different. The decorative panels here and over the entrance lobby are of special interest, since they are of zinc painted to look like wood, an innovative technique then, and thought to be the only surviving Victorian work of this kind. Because the construction was carried out in phases, the stone had to be taken from different quarries, and this still shows clearly on the façade. Later additions included the Clock Tower, which incorprates a water-tank (1865), and the ornamental pepper-pot towers ((1869-71). The figures on the front and sides of the Clock Tower's summit are the work of Joseph Durham (1866), and are of Queens Victoria, Anne and Maud ("Façade of [former] Public Record Office"). The one facing the courtyard, and above the main entrance, is of Queen Victoria. The library has been named after Sir Deryck Maughan, a past graduate of King's, and his wife Lady Maughan—important benefactors of the college. Chancery Lane Library & Information Services Centre. Booklet printed for King's College London(n.d.). "Façade of (former) Public Record Office."